The HL-85-LED-CPR-1227 super bright handheld 10 million candlepower spotlight with inline transformer from Larson Electronics is lightweight, ultra rugged, and features a comfortable ergonomic design. This unit uses seven high output Cree LEDs and an advanced reflector and lens configuration to generate 3,200 lumens with a beam reach of over 1,600 feet while drawing only 36 watts of power. 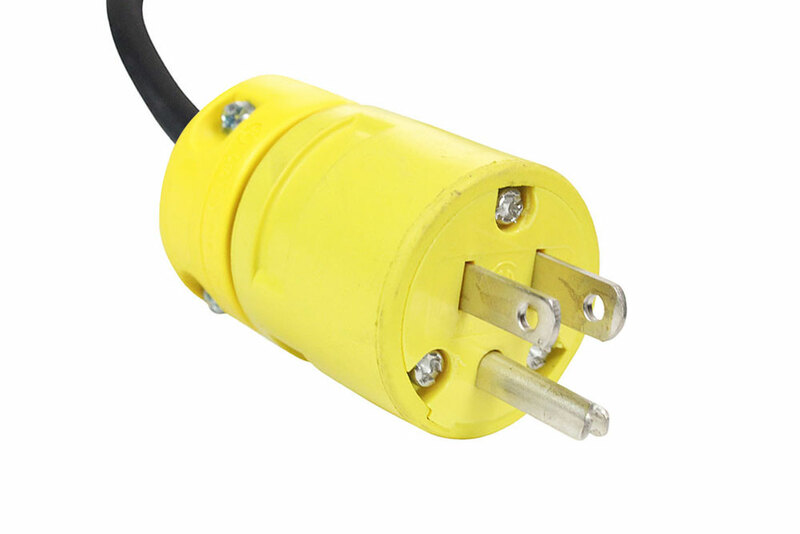 This light operates on 120-277V AC voltages and includes a 25 foot cord between the light and transformer and another 1` of cord between the transformer and the general area cord cap for connection to general wall outlets. The HL-85-LED-CPR-1227 features a continual on/off switch that requires one press to stay on and another press to turn off. Light Features: The HL-85-LED-CPR-1227 super bright hand held spotlight delivers an impressive 3,200 lumens while drawing only 36 watts of energy. With a combination seven high output Cree LEDs and a 5" reflector, this spotlight cuts through the darkness with a beam length of over 1,600 feet. The Cree LED units in this light have been chosen for their high lumen per watt ratio and extreme longevity. These Cree LEDs generate 56 lumens per watt effective lumen output and have a 70% lumen retention at 50,000 hours, giving them better efficiency and operational life than traditional light sources. The unique shape and shallow contour of the 120mm reflector is paired with a convex lens and inset lens position to efficiently capture and project a focused beam of light while reducing the light spillage and waste that is common with many spotlights. This efficient design also reduces casting, a phenomenon that occurs when wasted light "spills" around the light source. Often times, when surrounded by water, snow or other reflective surfaces, this light spillage prevents the human eye from adjusting properly and seeing objects at distance. With the HL-85-LED-CPR-1227 spotlight configuration, 90% of the emitted light is captured and focused, clearly and sharply illuminating objects all the way to the end of the beam reach. This IP67 rated waterproof spotlight features an ultra-durable ABS shockproof polymer body, an aluminum alloy light head housing, and an impact resistant polycarbonate lens. While the HL-85-LED-CPR-1227 is built to withstand rugged use and harsh outdoor conditions, comfort and ease of operation haven`t been sacrificed. This unit is ergonomically designed for balanced and comfortable handling. The 4.5"L x 1.5"D and 5/8 inch thick nylon handle has a no-slip textured surface that ensures a firm grip even in wet conditions. The booted push button is conveniently placed to allow operators easy forefinger access to the switch for quick on/off action. 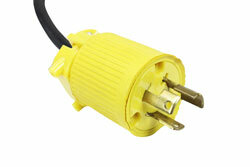 On/Off Switch Operation: The HL-85-LED-CPR-1227 LED hand held spotlight features a continual on/off switch. This means that the spotlight will stay on after a single button press and remain on until the power button is pressed again. Operators simply press the button once and will have a continual source of high-intensity LED light for their illumination needs until the on/off switch is pressed again to turn the light off. There is no need to keep pressure on the on/off switch at all times when light is desired unlike other spotlight models on the market that feature a trigger type switch. This operation of the on/off switch makes the HL-85-LED-CPR-1227 an easy to use and convenient source of portable LED light. 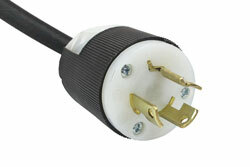 Wiring/Plug: This handheld LED spotlight is equipped with 25 feet of 16/3 chemical and abrasion resistant SOOW cord between the spotlight and the transformer and an additional 1 foot of cord from the other end of the transformer that is fitted with an industrial grade cord cap for easy connection to common wall outlets. 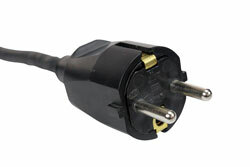 Plug options include standard 5-15 15 amp straight blade plug for 110V wall outlets with ground, standard 6-15 15 amp straight blade plug for 220-240V wall outlets with ground, NEMA L5-15 15 amp twist lock plug for 125V twist lock outlets, NEMA L6-15 15 amp twist lock plug for 240V twist lock outlets, British BS1363 13 amp fused 3-blade plug for United Kingdom outlets, or a two pin 16 amp rated Schuko plug with ground contact and socket for European outlets up to 250V. 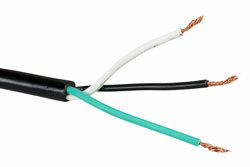 Alternatively, we can provide flying leads with no plug for hard wire applications or for operators who prefer to wire in user provided cord caps. 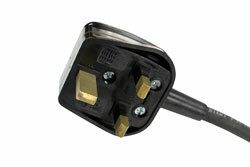 Please choose pigtail option below for flying leads with no plug.